2 drives, pivots, kicks to coach, exit cuts for a pass and shot or triple-threat move. 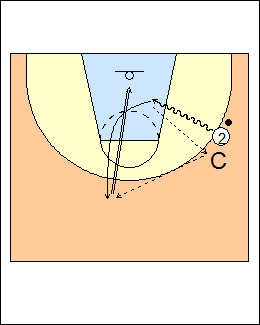 - coach plays in the post, relocating on a drive. Ryan Goodson - if the kick to coach is not on target, he will drop the ball and let it roll away. Each basket competes for most makes in one minute. See Layups - 4-out drive and kick, 1 on 1 - Drive and kick, Shooting - Procopio wing workout (feed the post on dribble relocation), Pistons cutting, Pistons bust-up.